Home Sika Roofing Hub Wind uplift: what are the risks and can you avoid them? If there’s one thing that every roofing contractor has to accept, it’s that you cannot change the weather. Rain can cause short-term delays on roofing projects, as can periods of snow or freezing conditions, but what are often not considered are the effects of the continuing elements on the roof. In particular, it is wind that can often prove most hazardous to the long-term integrity of a roof. Recently there has been an alarming increase in the number of wind uplift cases and the issue needs to be addressed by the roofing sector’s delivery chain in order to avoid the threat of serious injuries to members of the public and ensure that there is no unnecessary damage to the building or expensive repairs costs. It’s important, therefore, to understand best practice design requirements when it comes to specifying a roofing system. It is equally important to consider the existing system being refurbished due to a thermal upgrade or renewal of the waterproofing integrity. Many manufacturers do not consider the suitability of the existing substrate or cover this element as part of their guarantee, so therefore do not see the need to include this as part of their design requirements. The health & safety considerations for mitigating the risk of wind uplift should begin at specification stage. Irrespective of the method of fixing, there are risks associated with any system designed or installed incorrectly and this can be exacerbated if a wind load calculation hasn’t been undertaken or has been done without sufficient expertise. A trusted roofing system manufacturer should always undertake a wind load calculation which determines that the whole system specified (including the existing system being refurbished, where applicable) will endure the intensity of the wind pressure in that location. Such calculations should be based on data relating to the wind conditions in the project’s specific location and the most severe wind speeds and gusts associated with the area, rather than the average wind conditions. It’s important to note that coastal or exposed locations where greater wind speeds and gusts could present more extreme conditions may involve very localised challenges, beyond those of more sheltered city sites close by. It’s also critical to design the wind load calculations for the specific installation; an off-the-shelf approach is not acceptable. The calculation needs to be tailored to address factors such as the detailing involved and the height of the building. Working with a manufacturer with the technical expertise to advise on the suitability of a particular system for the substrate involved in the specific scheme is also an important part of mitigating the risk of wind uplift. Compatibility with recommended adhesives or mechanical fixings is vital to health and safety during installation and wind uplift resistance post-installation. Once again, designing the specification to meet the individual site conditions of the project is vital and understanding the exact composition of the substrate is especially important on overlay schemes where a previous system used may affect the effectiveness of some adhesives. During installation, contractor teams must be vigilant to ensure that wind doesn’t lift the system as it is being laid and, regardless of any pressures on the programme, they should avoid working at times when gusts could present a hazard. Post-installation, the integrity of the roof depends on the quality of the system used (including all adhesives, and / or mechanical fixings) and the skill of the installation team. Even a small area that has not been properly adhered to the substrate or sealed can allow wind to penetrate beneath the membrane and tear it from the roof. High quality liquid systems with a high bond strength are designed to adhere securely to the substrate, often, with no additional fixings. As a result, a liquid-applied membrane is often the more favourable system if the building is in an exposed or coastal location or if it is a high-rise structure. 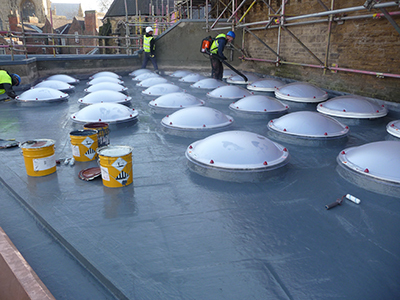 Of course, appropriate specification, quality products, sustained technical support and skilled installation all remain essential to successful installation or any roofing system, just as the health and safety risks of windy conditions at height must be factored into working methods regardless of membrane type. 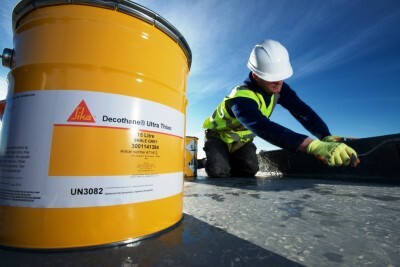 As a responsible manufacturer, Sika Liquid Plastics carries out a wind load calculation on all specified projects and our premium guarantee covers the suitability of the existing substrate ensuring peace of mind for the building owner for up to 25 years.